Well, well, well. That’s not a commentary of March for me unfortunately hence subsequent lack of info on some great early season racing from TriPurbeck athletes. First up in the Weymouth Half Marathon a couple of weeks ago Ray Courtney (clearly in a car) posted a rather fast 1:29 finish time. Given that he’s in my age group at Staffordshire I’m hoping he’s peaked too early (not really). Anyway I’m the master of that having peaked 21 years ago. Eric Sealey’s 2:05 finish time was faster than target and James eased himself back into action with a 1:53 finish. Adam Raymond also posted a pb with a time of 1.34 – awesome stuff. After a tough couple of months Terri was up and running again in the Lamar 10 mile event loved it – great effort! On to the multisport events – yes we like to involve water and wheels as well – and Derek was in action in a European championship qualifier. Somebody forgot to tell him he had already qualified. 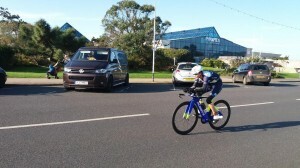 Anyway a stunning performance followed on the bike and run that put him ahead in his age group by one second. So to fool the opposition into a false sense of security – or maybe just because he is a bit of a pfaffer – Derek spent 36 seconds extra in transition to finish 2nd overall. Despite the pfaff Derek was quicker than last year and on the back of that performance he finally turned pro this week deciding to retire from his work to focus on triathlon full time! Now add some water……….. Bit early for triathlon you would have thought but that didn’t stop Laura, Maria and several of the juniors pitching up at the Mad March Triathlon to test their early season fitness and form. Brilliant performances all round with the stand outs being Laura who really put down an indicator that all that potential is starting to bear fruit with an excellent 2nd place overall in just over an hour and junior squad member Lexie Taylor who stormed the TriStart race beating all comers – boys and girls! Back to the adult race and Maria was a few minutes back from laura but still claimed third spot. Harley was third in the tristar 1 race despite a sore ankle and some strong opposition and Isla MacPhail also raced well in the tristar 1 race. Finally on to last weekend and David and Chris were running in the Yeovil half marathon. Both recorded excellent pb times – Chris breaking 1.30 and David producing a fantastic improvement to finish in 1hr43min. 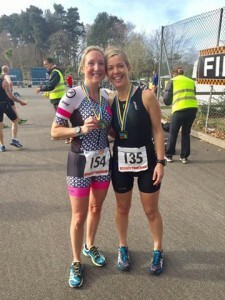 Finally last Sunday it was time for Fran to test out the re-built ankle on the race track in the Portsmouth Duathlon. Nige was also looking to gauge his improvement since starting training in January – literally from scratch. Aproximately 1hr 20min later and they were both finished! Fran’s ankle was sore but intact having eased out the runs at a shade over 20min 5k pace – perfect for the recovery process. Nige had an absolute blinder smashing his own expectations with a 23min first run – very decent bike and 24 min second run. Just don’t ask him about the portaloo incident. It’s ok though – he’s not in my age group at Staffordshire Also it was a chance for the first run out for Fran on her brand new Planet X EXO3 TT bike. Fast!!!!!!!!!! More racing this weekend – more posts to come – sun’s out – might even venture out myself……..